Forgetting password happens to everyone but what to do when weed to regain access to password-protected files or systems? Password Cracking is the series of operations of getting back passwords from the data stored in a computer system. We usually either try repeatedly to guess the forgotten password or recover a forgotten password replacing it with an entirely new password applying password cracking. Passwords recovery software is called to aid users to recover passwords for lost or forgotten email accounts. 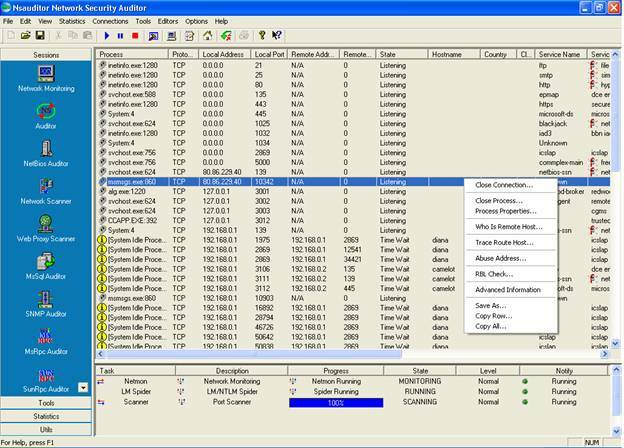 SpotAuditor is a comprehensive solution for Recovering Passwords and other critical business information saved in computers, it recovers more than 40 programs passwords. SpotAuditor is All-in-one password recovery program that offers administrators and users a comprehensive solution for recovering passwords and other extremely crucial business information saved in users’ computers. Cracking a Password is related to the functioning of the loss of information in a transmitted message. The process of password cracking requires in its possession a large number of possible candidate passwords to monitor the password substitution, each of which undergoes a scrupulous checking. Other methods applied by password cracking cover dictionary attacks, pattern checking, word list replacement, etc. Due to the significant growth of computing technologies, the methods and potential capacities of password cracking have greatly enlarged. A tool called graphic processor can enhace password cracking by 50 to 100 times as compared to general computers. Such a tool can snap apart a 10 letter password in a day. Password prevention is also very crucial. One of the best mechanisms is to ascertain that intruders can’t even gain access to the coded password. For example if encrypted passwords are stored in the file shadow which is accessible only to programs having enlarged privileges it will be much difficult and even almost impossible to be broken by evil intruders. As Stuart Fox mentions in his article in “TechNewsDaily” magazine:”For your confidential information to be safe you should use a 12-digit randomized password”, experts say. Richard Boyd, a senior researcher at GTRI says that “Eight-character passwords are insufficient now. If eight characters is all you use, and if you restrict your characters to only alphabetic letters, it can be cracked in minutes”. So to say more complex security measures are required now.”Code breaking software uses two techniques to break through password protections. The first is a large dictionary of common password phrases, which can crack simplistic passwords like 12345 and similar patterns. The other, brute force, simply tries every possible eight-character combination until it hits the right one. Brute force invasion used to require an unreasonable amount of time, but increasing computing power has allowed off the shelf computers to accomplish that task, Davis said. “If you have a 12 character password, and if your password is a combination of just gobbledygook letters, I think only an intelligence agency or some well funded organization would be able to break it in a reasonable amount of time,” Boyd said. Unfortunately, even 12 random character passwords may soon become too weak to provide sufficiently required protection. “If you have a Trojan that records keystrokes, you screwed,” Davis said. But like every aspect of computer security, password protection is a game of cat and mouse between hackers and security experts. Some banks in Europe have already begun issuing their customers special handheld devices that generates single use passwords, Davis said. By constantly rotating the password, the device defends against Trojans, and alleviates the need to memorize multiple random passwords. Of course, it’s only a matter of time until hackersmake out how to defeat that technique as well. Any technique that’s within time becomes banal and simplified,” Boyd said, “people make some headway in breaking. In any case, additional readiness to these kind of “black” cases and alert mind to protect one’s prosperity and detect possible “trespassers” will never harm.